Technological advances in properties of soft, flexible foam and elastomeric materials have continued to advance. These thick, soft, flexible foams and elastomers are ideal materials for sealing, gasketing and cushioning across many industries and applications. They compress, form to irregular surfaces, bend, and flex within an application without damage or de-lamination, but from the perspective of the die cutter, may also introduce challenges when trying to achieve the tight dimensional tolerances common in metal and plastic-molded parts. Die cutting a thick, soft and complex material (like laminated substrates) can raise issues due to material compression and deflection. (Read more about our different die cutting processes here) The challenges can be more dramatic as the thickness and softness of the materials increase. Because of these issues, assigning dimensional tolerances to parts made with such materials can be difficult. 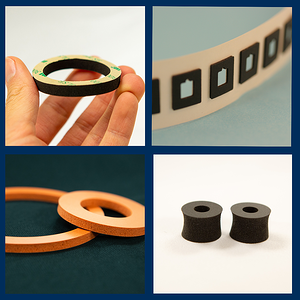 To learn more about the common challenges converting these materials and how Marian combats these issues, click the banner below download our E-Book, "Considerations with Tolerances When Die Cutting Soft Flexible Materials". You'll also be able to reference the former Rubber Manufacturers Association Handbook Tolerance Guideline Chart. As a leading converter, Marian takes pride in holding tight dimensional tolerances on a wide variety of materials. Marian has over 60 years of experience in die cutting soft thick materials. Our engineers and quality personnel fully understand and can anticipate challenges that may arise during the die cutting process. With in-house machine building capabilities, Marian has developed die cutting techniques and tool designs to help minimize or alleviate issues with holding dimensional tolerances. Contact Marian for a quote, rapid prototype and engineering design collaboration for your precision die-cut component needs. Do you like what you see and want to learn more? If you're interested in learning more about Marian and our wide variety of value-adding die cutting capabilities, give us a call at (800) 733-0062 or fill out our Contact Us Form and one of our material specialists will reach out to you. We'd love to be the solution to your next problem!